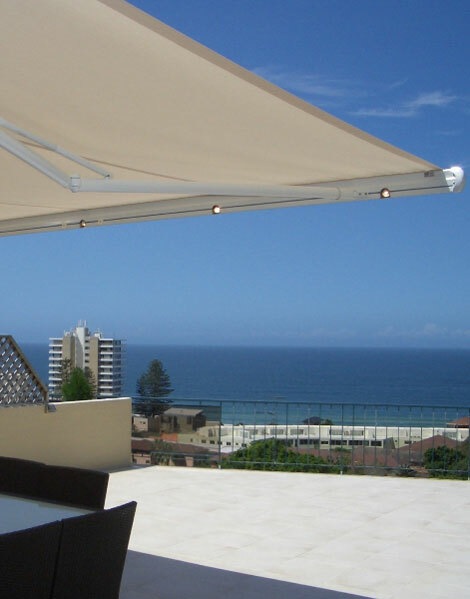 Create or extend your alfresco living space using a folding arm awning. These awnings use two or three articulated arms to project a sun screen fabric from its roller keeping the fabric taught and shelter from the direct sun. There are available in four distinctive styles, with a variety of different options to choose from and control can be motorised or via manual crank operation. This is the most stylish of the awning types. The profile of the front bar is designed to neatly interlock into the awnings head box, creating a smart fully enclosed cassette when retracted. Here the fabric and roller is housed in a cassette leaving the arms visible when retracted . This design is an open style that does not come with any covers like the semi or full cassette awnings that enclosed the operating hardware. This makes the style a more compact and the more affordable choice. This is a stand alone structure that can hold two folding arm awnings. The system is developed by Markilux and ultimate in outdoor entertaining areas. It can incorporate infra red heats, lighting and sound systems which can cover up to 56 square meters.